In the TV show The West Wing, the deputy chief of staff Josh Lyman once said, “I make it a point never to disagree with Labour blogger Hopi Sen when he’s right, Mr President.” (I may have paraphrased). But I think Hopi – and everyone else who makes the same point – are misdiagnosing the problem for Nick Clegg. Because the polls suggest, as politicians go, he really isn’t particularly unpopular. 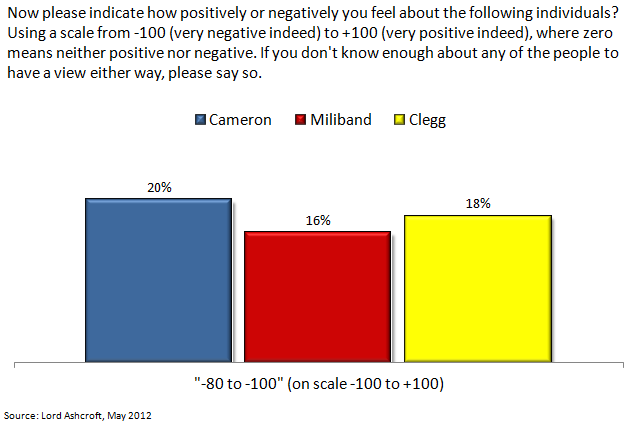 According to Lord Ashcroft’s May poll (which I use as it has a huge base size), Clegg’s average score, in terms of “how positively or negatively” people feel, on a scale of -100 to +100, is -11.7. This is slightly worse than Cameron’s -1.7 and Miliband’s -2.4, but is roughly on a par with -15.8 for Osborne and -10.6 for Balls. 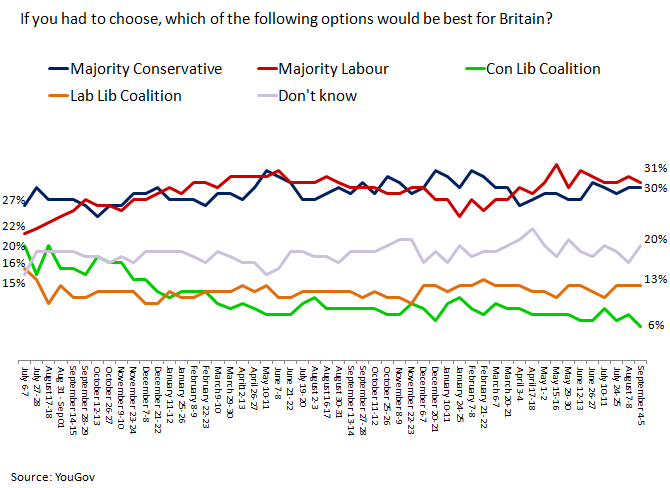 So on average, Clegg is relatively low though not bottom. But this doesn’t tell us about the spread of opinions. What’s more, the people who give him such negative scores are far more likely to be 2010 Labour voters than 2010 Lib Dem voters: compared with the 31% of 2010 Labour voters who rate Clegg so badly, only 13% of 2010 Lib Dem voters give him such low scores. Comparing the 13% of 2010 Lib Dem voters who give him such a low score with the 2% of current Lib Dem voters who do the same, we can work out that, among those who voted Lib Dem in 2010 but now wouldn’t do so, about 22% give Nick Clegg a score of -80 of below. 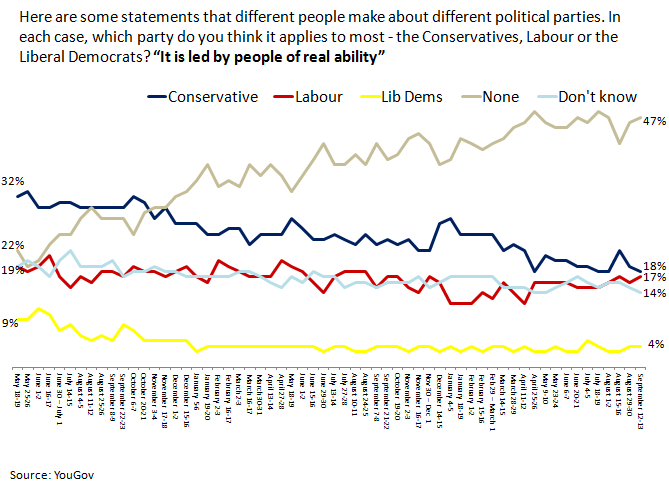 So even among current Labour voters and defecting Lib Dem voters (which are overlapping groups), less than a third appear to really dislike Clegg. It’s far from a good performance, but not in itself a sign that Clegg couldn’t do all right in an election again. So if he isn’t hated, what’s the issue for Clegg? There clearly is a problem that needs explaining given 76% of people think he’s doing badly. As party conferences begin, is Labour’s lead for real? George Osborne’s 2012 budget changed the political landscape. Following a winter where the polls had narrowed to parity, Labour started consistently showing double-digit leads within a week of the budget. At the time I wasn’t alone in arguing that, while Labour’s lead looked impressive, it was precarious. The evidence I cited included that Labour still didn’t have a lead on being best to handle the economy, and indeed had gained no support at all on this, only benefiting from a fall in belief in the Tories’ economic competence. But five months later, and on the eve of party conferences, Labour’s lead is still pretty much exactly where it was a week after the budget: around ten points. So was I wrong that the lead was so fragile? I don’t think so, though while it may still be vulnerable, the longer it lasts the more Labour are able to benefit from being ahead. But the stability of Labour’s lead is still important. Firstly, it suggests that people who came over to Labour in the spring weren’t just temporary visitors. Even over the Olympic summer, with an absence of political news, they have stayed with Labour rather than drifting away. The assumption now has to be that they will continue to support Labour unless persuaded to leave. The Department of Energy and Climate Change has started a new tracking poll on public attitudes to a few of their issues. The first wave was out earlier this year (details and results here), and wave 2 should be out soon. It won’t be much of a surprise that I’m generally in favour of polling. It’s important that people in government (and others with power) should know what the public think about the policies they’re making decisions about, and well-conducted opinion polls are a way of finding this out. They equalise the volume of everyone’s voices so that each opinion counts the same: media mogul or not (of course it doesn’t deal with how those opinions are formed). DECC’s poll is on an important topic, conducted not to create headlines but so the government can better understand what the public think, so I should be in favour. But I’m increasingly of the view that it’s been badly put together and is costing too much public money. The first issue is the quality of the questions. For brevity I’m just going to focus on the two climate change questions, though there are also others I could make the same argument about. One of the questions asks: “How concerned, if at all, are you about current climate change, sometimes referred to as ‘global warming’?”. The problem is that word ‘current’. I think it’s intended to distinguish 20th/21st Century climate change from historical climate change: the ice ages and so on. But when I first read the question, I understood it to mean the climate change we’re experiencing in 2012, as opposed to what we’re going to experience in 20 years’ time. Since I’m only a little concerned about the climate change we’re experiencing in 2012, I would answer the question accordingly. I don’t know whether others would understand the question as I did, or whether they would think ‘current’ is referring to 20th/21st Century climate change. Given that, I have no idea how to interpret the results of the question, and no-one else can know either. I don’t think there is such a thing as climate change. What on earth is choice 3 supposed to be doing? If I think that climate change is mainly human but could also be a bit natural, I could pick either choice 3 or choice 4. Someone who thought it was mostly natural but a bit human could pick choice 2 or choice 3. Given these different interpretations, it’s hard to know what the data mean.